Eight States Have Primaries on Tuesday. Here’s What to Watch for. Alabama, California, Iowa, Mississippi, Montana, New Jersey, New Mexico and South Dakota are voting on Tuesday. Here’s what you need to know about the main races. I took a break from chasing lawmakers through the Capitol see where to Mr. Tester, the Senate’s only active farmer, returns each weekend. President Trump may have put a big target on Senator Jon Tester’s back, but the Democrat is confident that Montanans know where he stands. National grocery chain WinCo Foods is inching closer to construction of its new store in Billings. As some in the Helena area begin planning outdoor adventures for Memorial Day Weekend, one piece of gear that shouldn't be forgotten is a raincoat. Isaac Trafton had something of a legacy to follow at Billings Central Catholic High. His mom teaches preschool in the system, and his three older brothers also excelled there. With an eye to boosting security, the Montana Rescue Mission is renovating the front entrance of its Women & Children's Shelter. Whether they prefer to observe Memorial Day on Monday or the traditional date of May 30, residents of the Helena area will have several opportunities to pay their respects this year. Wednesday was a somber and drizzly opportunity to honor 33 forgotten, indigent former residents of Yellowstone County. When Pope John Paul II appointed Rev. 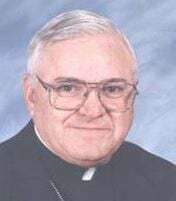 Anthony Michael Milone as an auxiliary bishop in 1981, the priest in the Archdiocese of Omaha remained at the same parish, taking care of the same people. Lockwood schools are making attendance optional for students Thursday and Friday because of a threat against the school, officials announced Wednesday. A system of heavy rain moving through the region has caused flooding in portions of south-central Montana, as runoff flows into rivers and creeks already swollen with mountain snowmelt. Three main observances are planned Monday as the community marks Memorial Day, the day the nation remembers the people who died while serving in the armed forces in defense of their country. A system of heavy rain moving through the region has prompted flood warnings and advisories in south-central Montana, as runoff is increasing flows on rivers and creeks already swollen with mountain snowmelt. Helena Public Schools signed a contract to enroll up to 16 students in Shodair Children’s Hospital's day treatment program starting in fall 2018. Members of Billings-based media outlets will be featured in the upcoming panel discussion, “Let’s Talk About Fake News,” taking place at The MonDak Heritage Center in Sidney from 6:30 to 8 p.m. on Thursday, May 24. A $230,000 project at Helena's Cherry Park will make playground equipment available to children of all abilities. A man is suing the Special K Ranch, an organization that operates a Christian home for the developmentally disabled near Columbus, alleging that his mentally disabled son was raped while staying at the ranch. Gasoline prices are up about 50 cents nationally as the busiest travel day of the year approaches. Billings Public School trustees officially inked their new superintendent to a two-year contract Monday. Police have detained a teen suspected of shooting a man in the neck Tuesday afternoon. Rain and thunderstorms are expected in the Billings area beginning Tuesday afternoon, with more severe spring weather in southeastern Montana. Often in medicine, time is of the essence. The Wild Women of the West and other groups will begin an effort this week to convert a small, grassy downtown lot into a pocket park. Former Helena City Manager Dennis Taylor will return to the position on an interim basis this summer. Helena's city commission voted Monday evening to approve an Urban Renewal District downtown. That Billings mansion owner who lost Billings' biggest home to creditors while being charged in Virginia with lying to the FBI? He’s now been sued by MY Company, a business owned by a convicted felon. Blaze Fast Fire'd Pizza, a national fast casual restaurant chain, will open on 24th Street West next to Rimrock Mall this summer. Widespread rainfall over southern Montana coupled with warm temperatures prompting rapid mountain snow melt could produce flooding along areas of the Clarks Fork of the Yellowstone River near Edgar and Belfry. Widespread rainfall over southern Montana coupled with warm temperatures prompting rapid mountain snowmelt could produce flooding along areas of the Clarks Fork of the Yellowstone River near Edgar and Belfry. Repairs to Interstate 15 near Jefferson City will likely last through the summer after a sinkhole forced closure of the road last week. Goslings gather to graze with an adult Canada geese on the banks of Lake Josephine at Riverfront Park on Monday morning. For downtown Billings to really come into its own, developers say it needs more apartments. An amber alert issued early Monday has been cancelled after a 16-month-old boy and his biological father were located at a South Side residence, according to the Billings Police Department. The Billings Police Department on Monday issued an amber alert for an approximately 18-month-old boy. The crack of six rifles broke across the Montana State Veterans Cemetery, their echo waning as a lone bugler began playing the first solemn notes of taps. Interstate 15 south of Helena has reopened to single-lane northbound and southbound traffic, after the road was closed Friday evening due to a culvert washout. Anthony Hope was angry for a long time — angry about losing his arm at age 2; angry about not graduating from high school; angry about drug use, family issues, health problems.